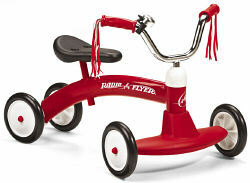 This Classic Radio Flyer Scoot-About is perfect for any toddler looking to ride in style. The signature red body is constructed with sturdy steel, and the handlebars are fashioned with classy chrome and a ringing bell. Steel wheels and rubber tires are durable and give children a smooth ride on even the toughest terrain. The seat is adjustable, so this ride-about can grow with your child. Body: 23 1/2" x 14 1/2" x 16 1/2"
Wheels: 5 1/2" x 1"